Author: Vrettakos Aristeidis , Vampertzis Themistoklis , Dimitriadis Anastasios , Vavilis Theofanis , Antonoglou Georgios , Papastergiou Stergios . Agios Pavlos General Hospital of Thessaloniki, Thessaloniki, Greece. Introduction: Supracondylar processes are vestigial remnants in humans that are usually asymptomatic, serendipitous findings, but under certain conditions, they can complicate the clinical presentation of other pathological entities. We present the first case of an elbow dislocation and the complications arising from the presence of such a process. Case Report: A 45-year-old female patient was admitted to our outpatient’s department after a fall on her outstretched right hand. The patient’s primary complaints were numbness and paresthesia mainly on her right thumb and index finger palmary, while she was also unable to perform any elbow movements. The elbow itself was edematous and painful on palpation. Radiographic evaluation revealed lateral dislocation of the elbow joint, accompanied by a chip fracture of the lateral condyle and a supracondylar process, 11 mm in length, over the medial epicondyle of the right humerus. Supplementary, a reduction in the radial pulse wave was noted. Reduction of the dislocated elbow was performed which restored the radial artery pulse wave, as confirmed by Doppler echography, but the neurological findings persisted. A posterior elbow splint was placed for 6 weeks, allowing gradually for acuter angle movements (90° in the 1st week, 45° in the 2nd week, 30° in the 3rd week, and full range of motion afterward). 6 months after the dislocation, the patient has a 10° extension lag, with full elbow joint stability restoration and is able to return to her occupation. Conclusion: To the best of our knowledge, this is the first report in literature, of the involvement of a previously silent supracondylar process during a lateral elbow dislocation. Hereby, we advise the attending physicians to take into account such anatomical variations when considering diagnosis and treatment of elbow dislocations. Keywords: Supracondylar process, humerus, lateral elbow dislocation, radial artery pulse wave, median nerve compression. 1. Newman A. The supracondylar process and its fracture. Am J Roentgenol Radium Ther Nucl Med 1969;105:844-9. 2. Symeonides PP. The humerus supracondylar process syndrome. Clin Orthop Relat Res 1972;82:141-3. 3. Kolb LW, Moore RD. Fractures of the supracondylar process of the humerus. Report of two cases. J Bone Joint Surg Am 1967;49:532-4. 4. Laha RK, Dujovny M, DeCastro SC. Entrapment of median nerve by supracondylar process of the humerus. Case report. J Neurosurg 1977;46:252-5. 5. Talha H, Enon B, Chevalier JM, L’Hoste P, Pillet J. Brachial artery entrapment: Compression by the supracondylar process. Ann Vasc Surg 1987;1:479-82. 6. Fragiadakis EG, Lamb DW. An unusual cause of ulnar nerve compression. Hand 1970;2:14-6. 7. Natsis K. Supracondylar process of the humerus: Study on 375 caucasian subjects in Cologne, Germany. Clin Anat 2008;21:138-41. 8. Ivins GK. Supracondylar process syndrome: A case report. J Hand Surg Am 1996;21:279-81. 9. Barnard LB, McCoy SM. The supra condyloid process of the humerus. J Bone Joint Surg Am 1946;28:845-50. 10. Kessel L, Rang M. Supracondylar spur of the humerus. J Bone Joint Surg Br 1966;48:765-9. 11. Spinner RJ, Lins RE, Jacobson SR, Nunley JA. Fractures of the supracondylar process of the humerus. J Hand Surg Am 1994;19:1038-41. 12. Jelev L, Georgiev GP. Unusual high-origin of the pronator teres muscle from a struthers’ ligament coexisting with a variation of the musculocutaneous nerve. Rom J Morphol Embryol 2009;50:497-9. 13. Ay S, Bektas U, Yilmaz C, Diren B. An unusual supracondylar process syndrome. J Hand Surg Am 2002;27:913-5. 14. Pećina M, Borić I, Anticević D. Intraoperatively proven anomalous struthers’ ligament diagnosed by MRI. Skeletal Radiol 2002;31:5325. 15. Sener E, Takka S, Cila E. Supracondylar process syndrome. Arch Orthop Trauma Surg 1998;117:418-9. 16. Horak BT, Kuz JE. An unusual case of pronator syndrome with ipsilateral supracondylar process and abnormal muscle mass. J Hand Surg Am 2008;33:79-82. 17. Thompson JK, Edwards JD. Supracondylar process of the humerus causing brachial artery compression and digital embolization in a fast-pitch softball player. A case report. Vasc Endovascular Surg 2005;39:445-8. 18. Thomsen PB. Processus supracondyloidea humeri with concomitant compression of the median nerve and the ulnar nerve. Acta Orthop Scand 1977;48:391-3. 19. Mittal RL, Gupta BR. Median and ulnar-nerve palsy: An unusual presentation of the supracondylar process. Report of a case. J Bone Joint Surg Am 1978;60:557-8. 20. Tzaveas AP, Dimitriadis AG, Antoniou KI, Pazis IG, Paraskevas GK, Vrettakos AN, et al. Supracondylar process of the humerus: A rare case with compression of the ulnar nerve. J Plast Surg Hand Surg 2010;44:325-6. 21. Burczak JR. Median nerve palsy after operative treatment of intraarticular distal humerus fracture with intact supracondylar process. J Orthop Trauma 1994;8:252-4. How to Cite this article: Vrettakos A, Vampertzis T, Dimitriadis A, Vavilis T, Antonoglou G, Papastergiou S. A Rare Case Report of Lateral Elbow Dislocation without a Major Fracture, Complicated by the Presence of an Ipsilateral Supracondylar Process. 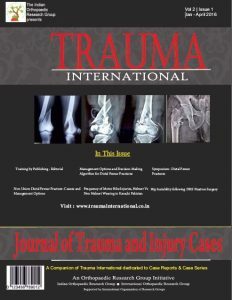 Trauma International Sep-Dec 2018;4(3):11-13.